Welcome to Dragon Week! This week we're going to be talking about the most popular creature type in Magic and the focus of Dragons of Tarkir. 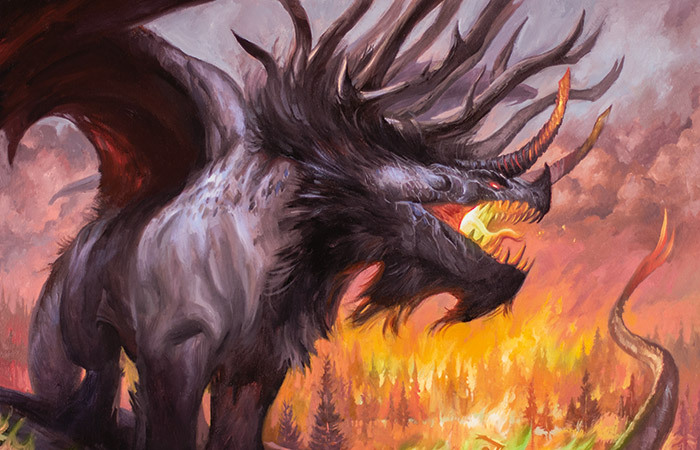 As I've already talked about Dragons last time we had a Dragon theme week (way back in 2003), I thought this time I'd go in a slightly different direction and talk about a common topic that the Dragons of Dragons of Tarkir (and Fate Reforged) have brought up. The topic is color-pie bleeding. The foundation of Magic is the color pie, which defines not only the philosophy of each color but also the mechanical representation. From time to time, we stretch what we mechanically (and also creatively) allow in each color. For example, Dragons are red's iconic creature. Why then are we allowing Dragons that don't have red in them? When we did an Angel set in Avacyn Restored, all of the Angels were a least partially white. Also, green is not supposed to have big fliers yet there are Dragons in mono-green in the last two sets. What's going on? Today's article is going to examine why we bleed the color pie and how exactly we do it. It turns out there are right and wrong ways to do it, so today's article will walk us through all the rationale behind why and how we do it. Let's start with the major question. If the color pie is so important (and it is—you can read this if you want me talking more at length about why), why then do we ever bleed it? Why do we allow colors to do something that they normally don't do? I talk all the time about how Magic is a pendulum (think of a piece of pointed metal swinging over a pit of sand) that R&D keeps pushing in different directions. We keep the game fresh by constantly moving the game to new places. I use the pendulum metaphor because there is a center to the game and we want to make sure the game doesn't drift, long term, and keeps coming back to the center. The default color pie is that center. But as you move away from it and try to create new unique worlds, each with its own take on the color pie, it's important that we have the ability to change things. If World A and World B had all the cards doing 100% the same things, the two wouldn't feel very different. The nature of our system is that we are constantly trying to find new ways to tweak what we do. Bleeding is an important part of this. Part of what makes a new world exciting is that it dips its toe in places that Magic doesn't normally dip (or hasn't dipped in a long time). Now, as you'll see today, the majority of each set stays in familiar territory, but it is the outliers that tend to grab attention and make it feel different. You don't have to change much to change everything. One of the challenges of designing Magic sets is we have to keep the gameplay fresh. There's a lot of repetition in design, but it's crucial that each set explores some new design space. The stuff we do every time is somewhat tapped out after 22 years, so it's the unexplored areas that have the greatest opportunity to find new things. Now, I should stress that unexplored territory involves much more than bleeding, but bleeding is an area that will give us access to new things to do. The color pie is flexible and allows a significant amount of variance, but bleeding things allows us to find creative areas that we couldn't explore before. For example, Vampires, by default, are black. Over the years, we've made numerous black Vampires and we've managed to portray them in various ways, but when Innistrad pushed them into red, all of a sudden we had access to Vampires with a very different feel than we'd ever had before. Players (or, one could argue, humans) are drawn to novelty. Seeing something you've never seen before is exciting. Color bleed makes for good previews because it causes a lot of stir and gets players talking. They stand out as cards because they are often unlike anything the players have ever seen. So it sounds like bleeding is great. Why aren't we doing it constantly? Well, because there are some pretty big downsides. Let's start with the biggest reason—it's dangerous. The color pie exists in the first place because it is crucial in making Magic work. The mana system pushes players to play fewer colors while the color pie pushes them to play more. This delicate balance is important. It allows us to make lots of different cards that can all be relevant in different ways. It ensures a rock/paper/scissors metagame by making sure that all decks have weaknesses that can be exploited if that archetype gets too powerful. It helps make the decks more focused thematically, which in turn enhances flavor. Every time we print a card that does something the color isn't supposed to do, we are teaching everyone that yes, the color does do this. See, the card's right here. Planar Chaos, the set where we messed with the color pie as the theme of the set, has caused me no end of headaches. Players are constantly quoting Planar Chaos cards as proof that a color can do something and I then have to explain why it doesn't. On my blog it's even a rule that you can't quote Planar Chaos when arguing color pie. The colors' strengths and weaknesses are carefully crafted to make sure there is a balance. When colors start doing things they normally cannot, this can offset this balance and create problems. Stealing focus is only good if that is the result you want. Bleeds can sometimes draw attention to themselves and away from other facets we want players to focus on. So in the end, bleeding can do good and it can do bad. The potential for bad, though, is a much bigger risk than the potential for good, so it's something we have to do very carefully. Next, I am going to talk about the spectrum of bleeding and explain why and how we use each segment along the spectrum. I've numbered this 0 because this segment is where there is no bleeding. These are the basic effects of the colors that we do every single set. Sometimes these will be reprints and sometimes these will be tweaks, often involving one or more of the new mechanics. This is design's bread and butter. These, for example, are the kinds of effects you put into your design skeleton (described here if you don't know what that is) because you know your set is going to have them. The majority of your cards are going to fall into this category. This next segment is for effects you do but with less regularity. Rather than do this effect every set, you do it, on average, about once a block. This can be for several reasons. Perhaps it's the type of effect that we don't want too many duplicates of in Standard. Perhaps it's something splashy that we want to keep cool and not overexpose. Perhaps it's something narrow that there's never much need for beyond a single card. This segment is not as core to the color pie as Segment #0 but it's not yet what I would call a true bleed. Colors do get to do these effects, just not as often as the staple ones. This segment is the cards that do effects we do occasionally but not every block. These effects are usually a little narrower and are only something we use when we need them. The most common use for these mechanics is when a set has a theme that we want to run through all the colors. As an example, normally white, black, and green are the colors with cards that interact with the graveyard, but when we do a block with a graveyard theme or subtheme, such as Innistrad, we need to have things that blue or red do. As this theme is something we hit upon on a regular basis, we've carved out small mechanical areas for blue and red. I like to think of these as supplemental mechanics that we break out when we need them. You can think of these as subtle bleeds that we've created for a long-term use. This segment is cards that do something the color normally does but then connects it to something more unorthodox. A good example of this would be Chained to the Rocks from Theros. The main ability of the card makes use of Oblivion Ring technology (exiling the chosen target while the permanent stays on the battlefield) but it has a quirky quality of requiring the enchanting of a Mountain. The first part is very white and shows up in most sets. The second part is unique to this card. The reason the card saw print was that the total package makes a very flavorful card that makes sense specifically in a Greek-mythology-inspired set. In other words, it made a card that works only in the block in which it was printed. This segment of cards takes two in-flavor abilities and then combines them to do something that is out of flavor for the color. The example I'll use here is the card Rescue from the Underworld in Theros. Sacrificing a creature is very black. Reanimating a creature (or in this case two) is also very black. The combined effect, though, is that the card essentially flickers the creature, which is an ability found in white and blue but not black. Much like Chained to the Rocks above, Rescue from the Underworld saw print because the total package of the card flavorfully fit the feel of the block. This next segment is effects that are normally out of color pie but that we allow to exist very occasionally—usually on special cards. Dragons existing outside of red fall into this category, as does big green fliers. Because these effects are so rarely used we try to be careful and save them for where they will matter most. It's why, for example, I was upset with Hornet Queen in Magic 2015 but supportive of the mono-green Dragons in Fate Reforged and Dragons of Tarkir. Hornet Queen, while flavorful in a vacuum, does very little to play into the overall themes of Magic 2015. In contrast, the Tarkir block is defined by the existence of the Dragons. If big green fliers is something we only get to use every five years or so, Tarkir block clearly was the proper choice. This next segment is what I refer to as color-bending cards. These are cards doing things clearly out of color pie, but not things that undermine the weakness of the color. Note that these cards shouldn't be bending the color pie for no reason, but rather to serve a larger cause. A good example from this segment would be Form of the Dragon from Scourge. The flavor of the card is that it turns you, the caster, into a Dragon. To capture the sense that you are flying, the card prevents creatures without flying from attacking you. This Moat-like effect is not a red ability, but all the pieces together felt so red that we allowed the card the bleed. Note that red has a lot of abilities to both destroy and block nonflying creatures such that the bleed, while out of color, was not fundamentally allowing red to do something it's supposed to be have trouble with. This last segment is my personal bane. These are the cards that do what I call break the color pie. They do effects outside the color that actively help the color overcome some weakness that's been built into it. The classic example of this segment is Hornet Sting. One of green's weaknesses is supposed to be that it needs its creatures to deal with other creatures. It has things like fight and Lure effects, as well as just having slightly larger creatures, as a means of its creature control. It is not supposed to be able to use its spells to directly kill creatures. Hornet Sting violates this rule. As a result, this card, which feels very weak on its surface, was sideboarded in Constructed play because green so badly needed the effect that it was willing to overpay for it. When I talk about cards endangering the game, these cards are the ones I'm talking about because they start breaking down the barriers between the colors. To make matters more complicated, the players have some very strong feelings on this topic. The two most vocal groups are what I'll dub the Agents of Chaos and the Agents of Order. This group sees the color pie as an unneeded and unwanted set of rules. These players bristle every time you explain why some card cannot be made, especially if there is a flavorful way to justify it. To them, Magic is a sandbox and they want every toy available to play with. This group is constantly pressuring us to make cards doing things that have not been done. Having specific weaknesses for colors seems stupid to them and they are always on the lookout for cards that let a specific color deal with a problem it has always had. Their response to the cycles of Dragons in Fate Reforged and Dragons of Tarkir: "Excellent. Now when can we expect cycles of Angels, Sphinxes, Demons, and Hydras?" This group sees the color pie as a sacred thing. As far as these players are concerned, no color bleeding should occur. Every time a color bleed card is printed it is documented and then commented upon. These players constantly pressure us to never color bleed again. 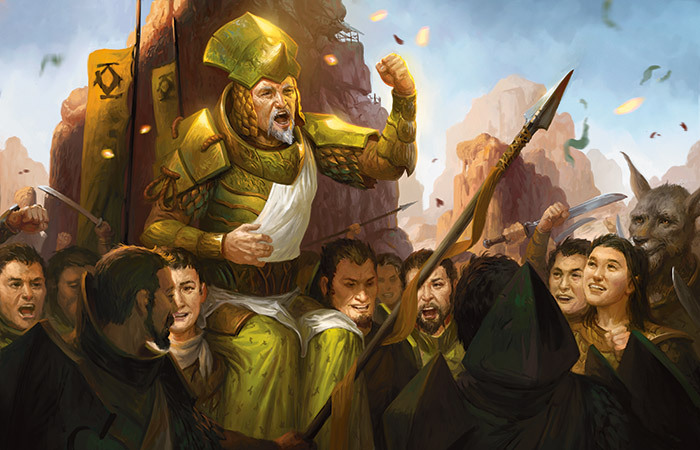 Their response to the cycles of Dragons in Fate Reforged and Dragons of Tarkir: "No, no, no, no. What's next? Black creatures that must attack and red creatures that cannot block?" • Is This Bending or Breaking the Color Pie? This distinction is very important. Does the existence of the bleed undercut the separations between the colors? Is this card more likely to allow decks to stay monocolor and not have to branch out? Is this card lessening a weakness endemic to a color? In short, is the bleed doing something that will make the colors less distinct long term? If the answer to any of these questions is yes, the card should not be made. • Does the Card as a Whole Feel on Color? Even when bleeding, the goal is to keep cards in flavor. Elements can bleed but the overall effect of the card should match the color it's on. Form of the Dragon is a great example of this lesson in practice. Moat is not red but turning someone into a Dragon is. • Are You Doing This Bleed to Help the Set or Make a Cool Card in a Vacuum? Color bleeding—like anything else in design—is a resource, and one that has to be used sparingly. As such, it is best used when it is advancing the set as a whole rather than just itself. If it makes an individual card sing, keep it until you have a set where that individual card can be part of the larger theme. • Is the Bleed Filling a Need in the Set or Is the Set a Means to Justify the Bleed? You should bleed because you need to not because you want to. Doing something you've never done before for the sake of having done it is bad design. Every tool, especially bleeding, should be used because it advances the design as a whole. The big takeaway here is that color bleeding has a place in Magic design but it something that should be used very carefully and deliberately. As always, I'm interested in hearing your feedback on this topic. You can write to me through my email or any of my social media (Twitter, Tumblr, Google+, and Instagram). Join me next week when I'll double down. Until then, may you bleed carefully. This podcast is another in my "20 Years in 20 Podcasts" series. Matt Cavotta joins me on this episode as he and I talk all about traveling around the world for Magic.